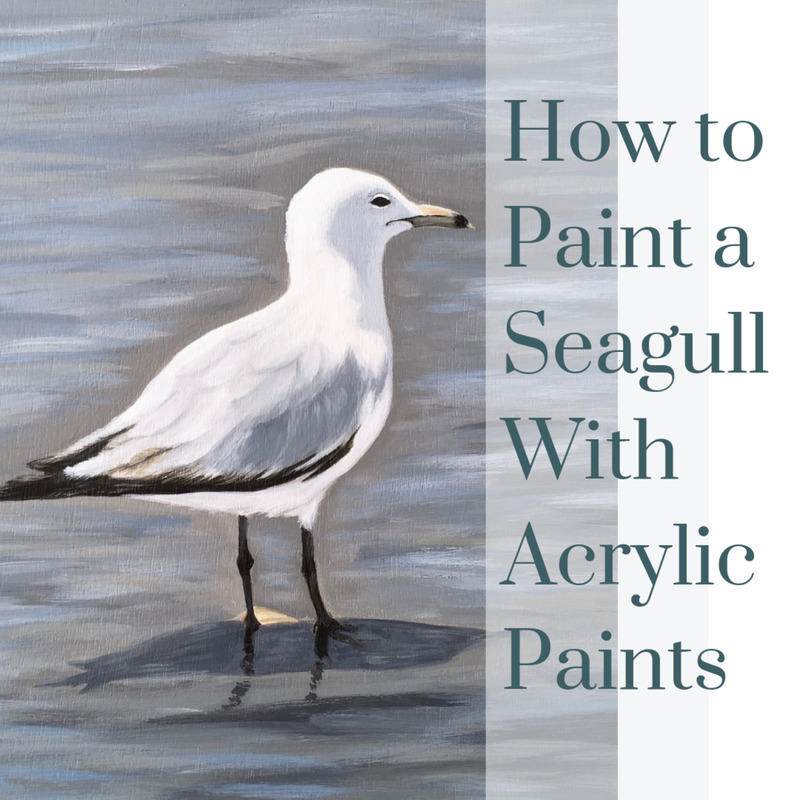 The very qualities that make acrylic paint so special and enjoyable—like the fact that it dries quickly and is not water soluble when dry—can become dreadful traits when it comes to cleaning it up. 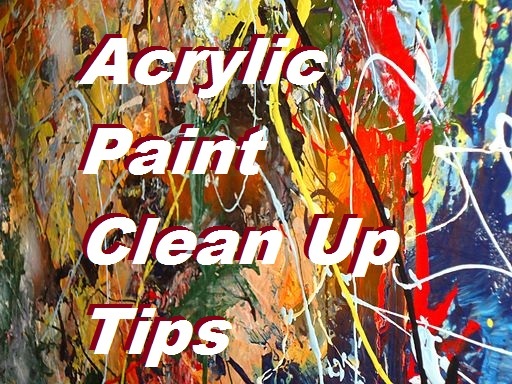 When you are cleaning up acrylic paint from porous surfaces or from brushes, the sooner you act, the better. Don’t let the paint dry, or you may never be able to clean up completely. If for any reason you have to delay the cleaning, make sure that you keep the spot wet. Keep the paint from drying so it remains water soluble. No matter what kind of brushes you use, natural or synthetic, they can all get ruined pretty quickly if you let acrylic paint dry on them. 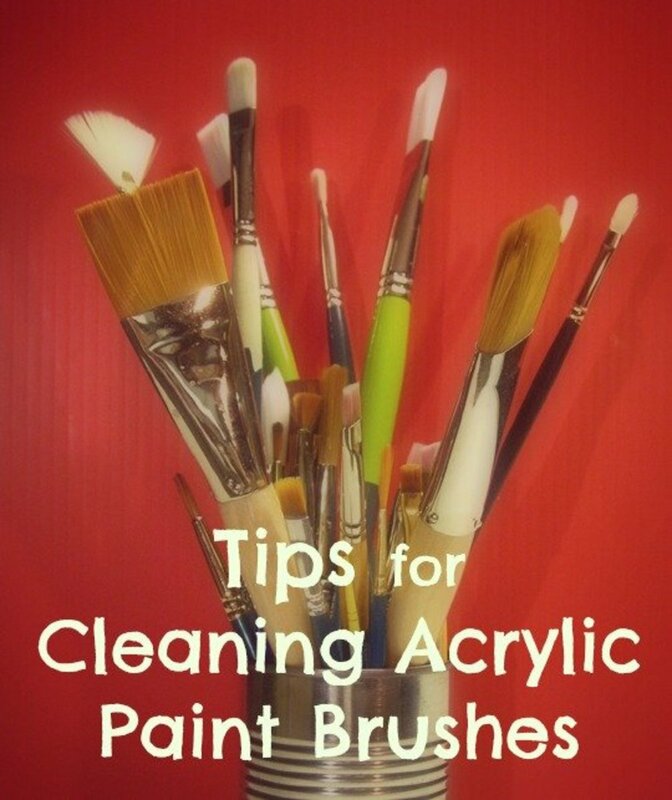 It can truly ruin the bristles of your brushes, and there is not much to do to rescue them after that happens. I prefer to use synthetic brushes, because acrylics adhere more to natural bristles, making them much harder to clean. Since acrylic paint dries fast, it can be challenging to preserve your brushes, especially while working on a painting using different kinds of brushes at the same time. The worst thing about acrylics is that they dry fast, and the best thing about acrylics is that they dry fast. Rinse your brushes well in between uses. Keep them wet during painting sessions – this does not mean keeping them soaked in water. Leaving brushes in water containers for very long will ruin them as well. Keep the bristles moist in order to avoid residual paint from drying on them. Wash your brushes with warm soapy water right after your painting session ends, rubbing it in circles on the palm of your hand. Make sure you clean between the bristles too, especially the area close to the ferrule. Rinse well, squeeze it dry, and then re-shape the brush. Let your brush dry horizontally. If you store the brushes vertically when still wet, moisture will penetrate under the ferrule, ruining it in the long term. If you follow these tips you'll be able to keep your brushes in great shape and save money in the long run. 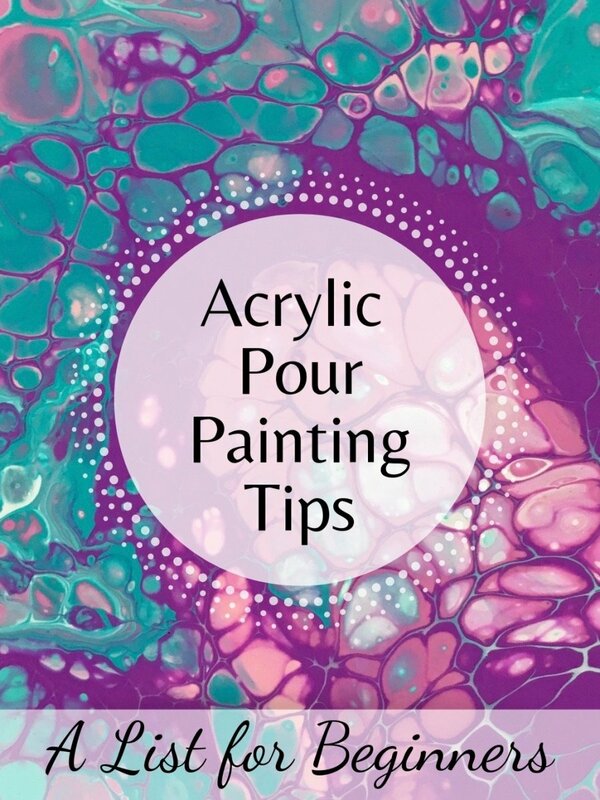 If acrylic paint gets on your clothes, you need to wash the stain immediately while it’s still wet with soapy water, rub well, and rinse thoroughly. If the paint is hard to get off, you can add washer detergent or spray spot remover and rub with an old toothbrush. Don’t let the paint sink into the fabric and dry, or it will be almost impossible to remove. To avoid any stress about getting stains on your outfit, be careful about what you wear for painting. Pick something you don’t mind getting ruined, so you don’t have to worry if it gets stained. An apron can help protect clothes. 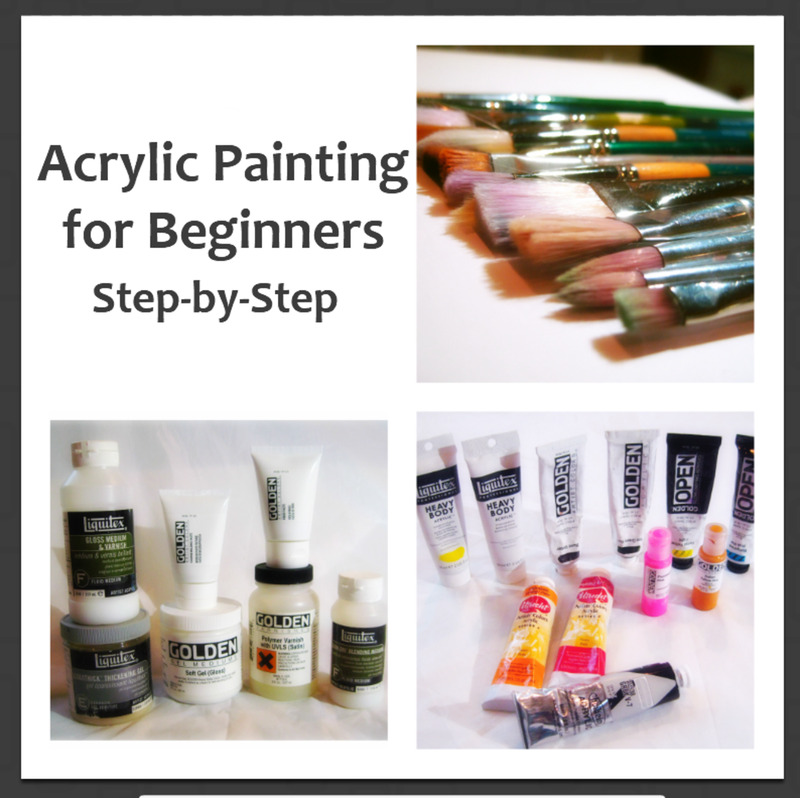 Depending on the material of your palette, there are different methods for cleaning dry acrylic paint. I would not recommend the use of a wood palette for acrylic paint, because the porous surface of the wood absorbs a lot of paint and cleaning becomes a struggle. Non-porous surfaces, like plastic, glass or ceramic are the best choices for acrylics. If you already have a wood palette, you can consider covering it with plastic wrap or sealing it with acrylic medium to reduce absorption. Then you can follow the cleaning tips for non-porous materials below. 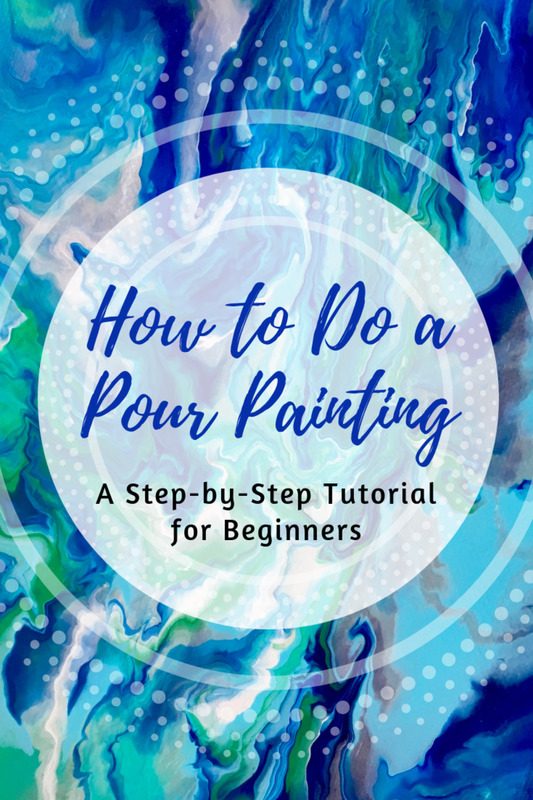 To get acrylic paint off non-porous palettes, first, wipe off the wet paint with a paper towel and throw it in the trash, then wash your palette with soapy water. 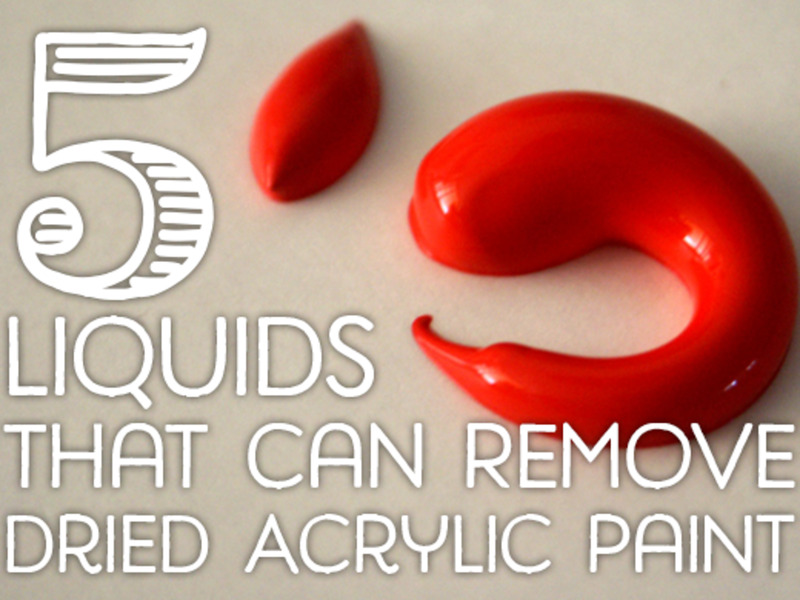 If the paint dries, it forms a rubbery layer that can quite easily be peeled off and disposed of. If you have a hard time scrubbing the paint off your palette, spray some window cleaner (i.e. Windex) on it and let it sit for a couple of minutes. 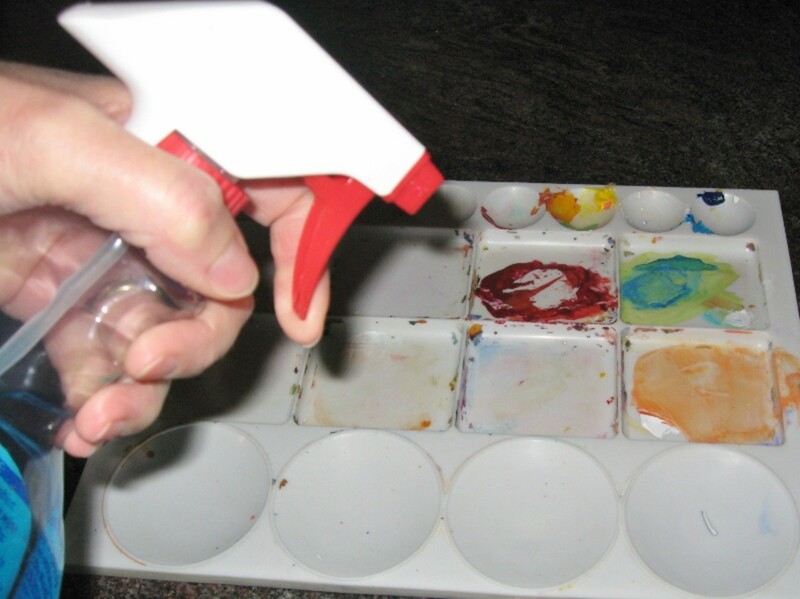 This is my favorite way to clean up my palette. It's very easy. Disposable paper palettes are very popular these days. You can buy tablets of waterproof, tear-away paper sheets that are disposable, and you just trash them when you are done. 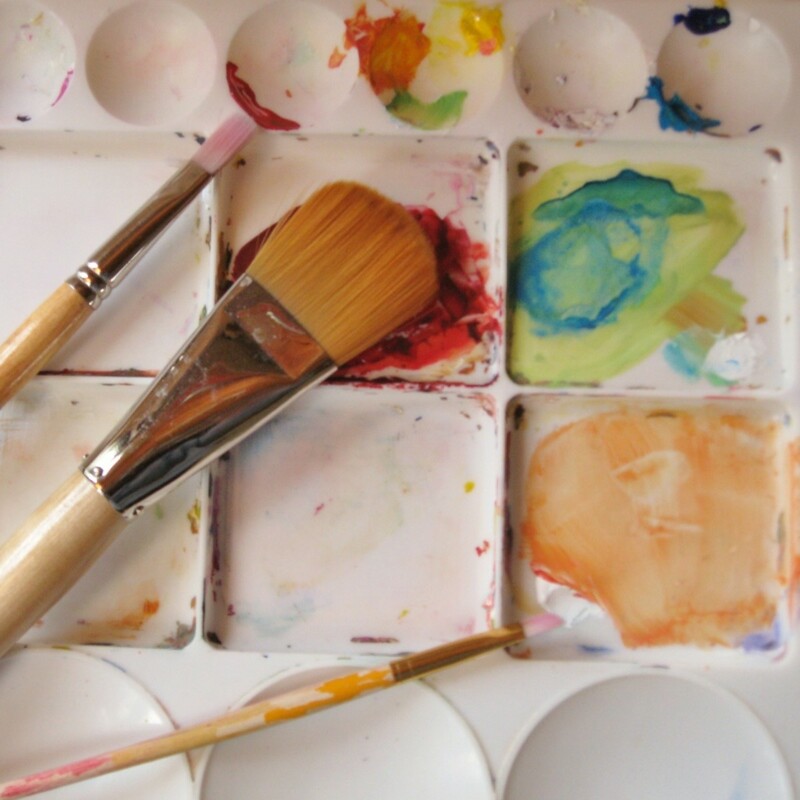 With disposable paper palettes, you completely avoid the hassle of cleaning up your palette. Also, you eliminate all the problem of paint ending up in the waterways every time you wash your palette, causing water pollution. I use them often, both for my acrylics and oil paints. I particularly like the light gray kind, it helps to see the true value of the mixed colors. I like using a light gray disposable palette, it helps to see the true value of the mixed colors. Nice water-proof sheets, wet paint puddles can be wiped off and you can reuse the mixing areas. Allows easy start from a clean palette every time, just throw away the top sheet. 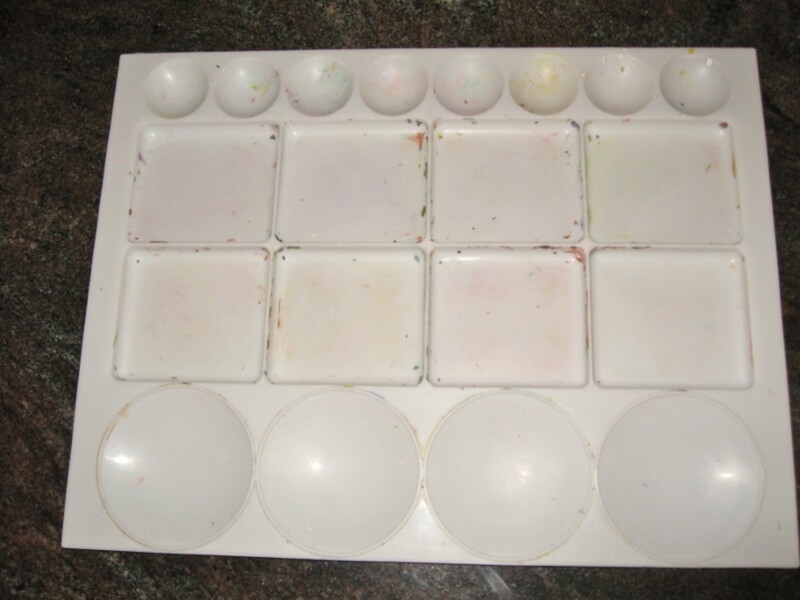 Leftover paint on your palette should never get washed down the sink drain. It is very polluting for the environment. 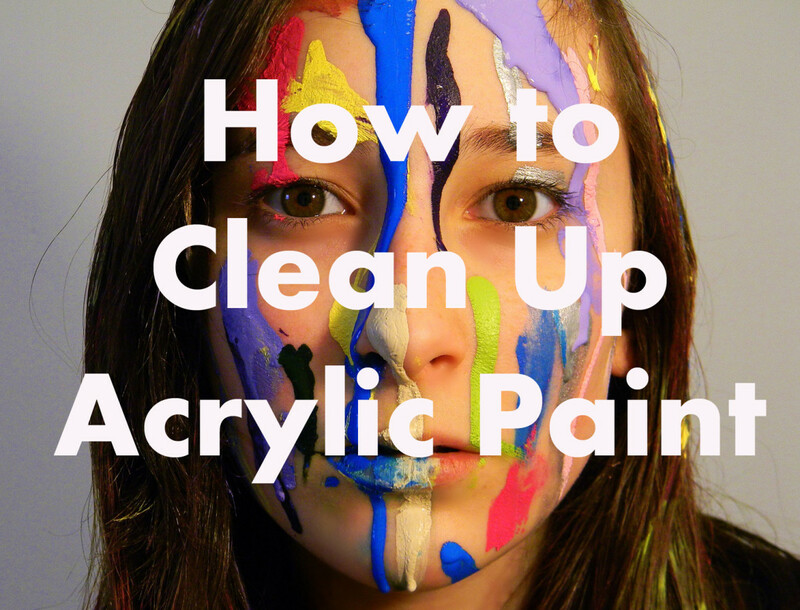 Paint contains a lot of chemicals that should not get into our blood system. Keeping that in mind, be aware of what you breath in and touch. Also, avoid getting a lot of wet paint into the waterways or in contact with eating tools. When you wash or hands or brushes in the kitchen sink, be cautious to wipe off the brushes in advance and not to contaminate dishes, glasses, etc. Avoid washing big amounts of paint down the sink. Wipe off any wet paint with a paper towel and throw it into the trash can, where it will eventually dry out. What do you do if the acrylic paint has already dried on the paintbrush? Is it ok to wash my hands and painting tools in my kitchen sink? Paint has a lot of chemicals that are bad for the environment and should not be ingested. Keeping that in mind, try to minimize the amount that goes into the waterways and in your food. 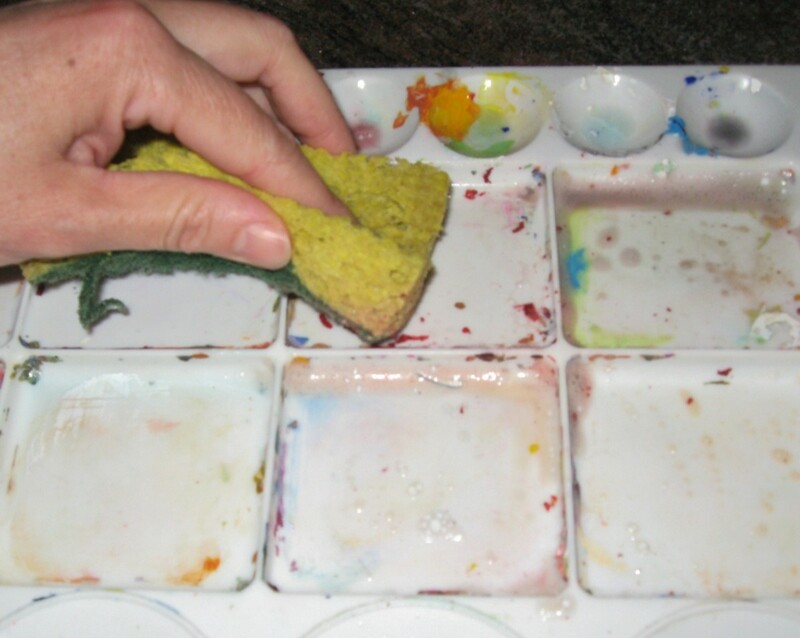 When I’m done painting, sometimes I do wash my hands or lightly dirty brushes in the kitchen sink, but I am cautious to wipe off the brushes in advance and not to contaminate dishes, glasses, etc. One thing that you should carefully avoid is to wash big amounts of paint down the sink, any sink. If you have a big blob of paint left on the palette, let it dry and then peel it off and into the trash can. Or, you could wipe it off with a paper towel when still wet and throw the paper in the trash can. I used acrylic paint on ends of wooden spoons. Will the paint wash off? What could I seal it with? I doubt that acrylic paint will wash off any wood surface. Wood is porous and absorbs some of the paint. After the paint dries, you can peel it off a plastic support, but it adheres to wood much more. You may have to sand the wood to get rid of the paint layer. To isolate the wood, so it does not absorb, I would use an acrylic gel medium or an acrylic varnish. 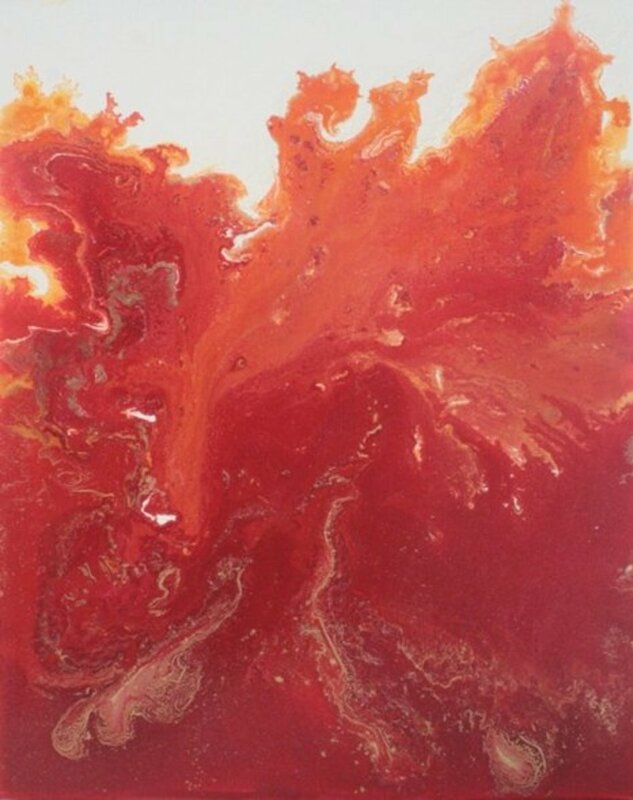 If I can't wash my hands in the kitchen sink after painting with acrylics where can I wash them and how do I get rid of the water? It's ok to wash your hands or brushes in the kitchen sink, but be cautious to wipe off the brushes in advance with a paper towel or old rag, carefully avoiding to wash big amounts of paint down the sink, any sink. Most importantly, avoid contaminating dishes, glasses, etc. Ah, that sounds fun and a very creative and artistic way to solve the problem. I have a shirt that I really liked and now has paint spots, I might try adding more myself and see what happens. Thanks! I could not get some acrylic stains from my jeans, so I decided to add more. I ended up with some very complimented pants, lol. Thanks jbosh1972, I appreciate your feedback. It's always good to hear what really works for people and learn that way, instead of though our own mistakes. Mistakes can be very costly sometimes. :) Happy painting! The Murphy's oil soap trick makes perfect sense. The surfactant properties causes the acrylic to loosen its adhesion and help water to wet the paint for removal. I did write an article about 5 liquids that can clean up dried acrylic paint but cleaning up while paint is still wet is the best idea. Goes along with the saying an ounce of prevention is worth more than a pound of cure. Great tip, thanks for sharing Glen! Best tip for cleaning even partially dried brushes is to soak them in Murphy's oil soap (don't dilute) overnight and then soap and water to thoroughly clean. Brings back brushes you thought were toast. I think I will use a special shirt and plastic mats underneath. I have a set of acrylics I am about to try over the winter. I think I will dedicate special brushes for it...was going to use my watercolor brushes; after reading this - I think not. I will check your articles on acrylic. Thank you. Wow excellent article, I like this. The paper plate palette sounds like a great environment-friendly solution. Though I do get bothered by the old paint stains, it gets too confusing, I doubt I could do it, but way to go for finding your way! I have got to be one of the worst at this. I have paint stains on nearly every shirt I own. I no longer use paper towels; I just wipe the brushes on my shirt. Also, I had to stop buying expensive brushes cause I kept leaving them upside down in a glass of water. While this keeps the paint from curing to the bristles, it compromises the shape of the brush if left too long. Live and learn. I noticed you mentioned disposable pallets. I never tried them, but I've been using paper plates for years. What paint goes unused dries to the plate which reinforces it and makes it more watertight. So if it doesn't bother you to see old dry paint under your fresh wet paint, I highly recommend it. I've used the same paper plate for over a year now; it just keeps getting thicker and thicker. Great Hub, Thank You for sharing. Sounds like you are ready for a new adventure, don't wait any longer; as we say in Italy "hit the iron while it's hot". Now that you broke the ice keep at it, my friend, release the creativity from within and have fun. Blessings to you too and good luck for everything. I have been reading your posting for a while and I wanted to say thanks for all your advise. After 4 months, I finally painted something. A friend of mine needed to paint a Disney landscape, and he let me help. Acrylic dries faster that what I thought and cleaning the brushes often was important to keep the flow of the stroke nice and even. Thanks Robie, and look I forward to read your posting, see your paintings, and learn your teachings. Thanks my friend and God bless you and your family. Thanks for reading and leaving feedback! Great advice! I taught art groups with seniors a few years back, and acrylic was the easiest medium for them to work in. Unfortunately, it's also a challenge to clean up if you aren't on the ball. I learned the lessons you are explaining here the hard way: clean brushes immediately after use and get it off your clothes ASAP!